Good housekeeping and regular cleaning is essential in order to maintain the performance of Dyflon Self-smoothing Epoxy Floor System. It is particularly important in areas that are subject to regular spillage of chemicals. Spillages should not be allowed to dry, which results in higher concentrations of the chemicals, which may lead to early failure. Regular cleaning of surface with a rotary scrubbing machine in conjunction with a water miscible cleaning agent or hot water washing at temperatures up to 50°C is recommended. The 100% Epoxy Non Slip coating can be used to prevent accidents on the side walks, ramps, trucks, production areas driveways, basement floor, bricks and stones, steps and more. 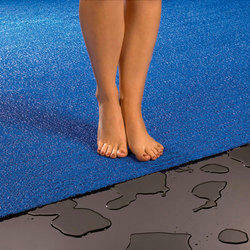 Designed for use on the floor areas which are subjected to abrasive traffic, impact and/or corrosive spillage. Easy to apply this paint, yet tough enough to stand up to heavy vehicular traffic even fork lift truck on floor areas. This permanent non skid coating can be painted to prevent slip accident and the save down time by eliminating slippery area in any work environment even if covered in liquids. 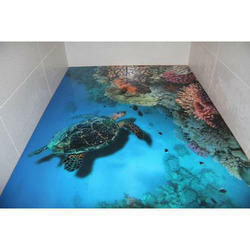 Epoxy paint Non Slip coating are available in clear, black, blue, and yellow as well as custom matched floor colors. Easy to clean and permanent bond to concrete, metal, unfinished wood and more. For uses indoors and outdoors on sidewalks, metal, unfinished wood and more. Chemical Resistance Dyflon Self-smoothing Epoxy Floor System is resistant to a wide range of liquids and chemicals, for specific information please refer the Dyflon Chemical Resistance chart.